The Indians have traded left-handed swingman Ross Detwiler to the Athletics for cash considerations, Paul Hoynes of cleveland.com was among those to report (Twitter link). Detwiler will head to Triple-A Nashville, tweets Ryan Lewis of Ohio.com. Detwiler, 30, is now set to join his fourth organization over a two-year span. He logged just 4 2/3 innings with the Indians this year, surrendering three earned runs on three walks and four hits, before they designated him for assignment in April. Detwiler then accepted an outright assignment to Triple-A Columbus, where he compiled a 4.60 ERA, 5.89 K/9 and 3.02 BB/9 in 12 starts. Previously, Detwiler racked up 58 1/3 frames for the Rangers and Braves last season, though he posted an unsightly ERA (7.25) and a similarly ugly walk rate (5.55 per nine). All told, Detwiler has thrown 534 big league innings with four different teams and recorded a 4.21 ERA, 5.54 K/9, 3.27 BB/9 and 46.3 percent ground-ball rate. Those numbers are respectable on the whole, and Detwiler’s only two years removed from putting up a 4.00 ERA over 63 innings, but it’s fair to say he hasn’t lived up to his draft stock since the Nationals selected him sixth overall in 2006. Detwiler, who’s scheduled to become a free agent at season’s end, will try to eventually work his way back to the majors with the Oakland organization. He’ll face an uphill climb, though, as he’s not on the Athletics’ 40-man roster. At the major league level, the A’s currently have two lefties apiece in their rotation and bullpen, as their depth chart shows. The Indians announced today that left-hander Ross Detwiler has accepted an outright assignment to Triple-A Columbus after clearing waivers (Twitter link). Given his service time, Detwiler could have rejected the assignment in favor of free agency, but he’ll instead seek a return to form with Cleveland’s top minor league affiliate. It’s been a rough 13 months for Detwiler, who was traded from the Nats to the Rangers last offseason and has since struggled in Texas, Atlanta and Cleveland. In 63 innings across the past two seasons, the 30-year-old has a bloated 7.14 ERA with nearly as many walks (40) as strikeouts (44). Detwiler, though, was a solid contributor to the Nationals’ pitching staff from 2010-14, recording a 3.61 ERA in 394 1/3 innings pitched while splitting his time between the rotation and the bullpen. Kyle Crockett is currently the lone lefty in Cleveland’s bullpen, while Detwiler and fellow veteran Tom Gorzelanny are the only lefties in the Triple-A bullpen. That would seem to open a window for Detwiler to return, though the club could also pluck a starter such as T.J. House or Ryan Merritt from the Triple-A rotation and insert him into the Major League relief corps. The Indians announced on Friday that they’ve activated right-hander Tommy Hunter off the disabled list and designated lefty Ross Detwiler for assignment in order to clear a spot on the active roster. Detwiler, 30, signed a minor league deal with Cleveland and made the club out of Spring Training but has struggled in the early stages of the ’16 campaign, allowing three runs on three hits and four walks with three strikeouts in 4 2/3 innings out of the bullpen. Once a solid fifth starter for the Nationals, Detwiler was shifted to the bullpen in 2014, where he provided Washington with 63 innings of 4.00 ERA ball. That marked his last somewhat productive season in the Majors, though, as Detwiler was traded to the Rangers in the 2014-15 offseason and posted an unsightly 7.25 ERA in 58 1/3 innings split between the Rangers and the Braves. Hunter, 29, signed with Cleveland this past offseason. While he originally had a reported two-year offer in the $11-12MM range agreed upon with the Yankees, New York backed out due to medical concerns, and Hunter would ultimately sign for a year and $2MM with the Indians. Hunter landed on the DL to open the season due to a groin injury and some lingering effects from offseason hernia surgery, but reports indicated that neither was the cause for New York’s apparent trepidation. Hunter solidified himself as a reliable middle-relief/setup arm with a pair of strong seasons in Baltimore from 2013-14 (2.88 ERA, 6.9 K/9, 1.6 BB/9 in 147 innings), but he was somewhat surprisingly traded from the Orioles to the Cubs last summer despite the fact that he’d again posted solid numbers and the Orioles made other win-now moves (i.e. acquiring Gerardo Parra from the Brewers). Hunter struggled with the Cubs, surrendering 10 runs on 20 hits and three walks with 15 strikeouts in 15 2/3 innings. He’ll look to return to his 2013-14 form now as a member of a Cleveland ’pen that has seen its share of struggles (most notably among closer Cody Allen and setup man Bryan Shaw). With a nice showing in Cleveland, Hunter could work his way back toward the multi-year deal that so narrowly eluded him this past winter. 4:50pm: Cleveland has announced the deal via press release. 4:20pm: The Indians and left-hander Ross Detwiler have agreed to a minor league contract, reports Jon Heyman of CBS Sports (links to Twitter). If he makes the club, Detwiler will earn a $1MM base salary, and his contract also contains an additional $1.5MM worth of incentives. Detwiler, a client of CAA Sports, split last season between the Rangers and Braves but struggled at both stops. The former No. 6 overall draft pick had spent his entire career prior to 2015 with the Nationals, the organization that drafted him, compiling a 3.82 ERA with 5.4 K/9 and 2.9 BB/9 across 471 innings. Detwiler split his time fairly evenly between the bullpen and rotation with the Nationals — 69 starts, 63 relief appearances — but he started just seven games last season (all with the Braves). Home runs were Detwiler’s undoing in Texas, as he yielded nine of them in just 43 innings of work with the Rangers en route to a 7.12 ERA. Upon going to the Braves, the lefty displayed significant control problems — 15 unintentional walks in 15 1/3 innings — which have never been a problem for him in the past. Ultimately, a hamstring injury suffered in early September ended his season and his time with the Braves. There weren’t many positive takeaways from the 2015 season for Detwiler, but the 29-year-od did hold lefties to a .660 OPS and has always been pretty effective against same-handed batters, yielding just a .233/.314/.301 batting line to such opponents. He’ll join fellow southpaws Joe Thatcher and Tom Gorzelanny as non-roster invites in Spring Training, hoping to edge out one or both as he seeks to land a big league roster spot. Unlike those two, however, Detwiler could conceivably battle for a rotation spot, although with Corey Kluber, Danny Salazar, Carlos Carrasco, Trevor Bauer, Cody Anderson and Josh Tomlin all ahead of him, that looks unlikely at this juncture. 1:52pm: MLB.com’s Mark Bowman tweets that Detwiler’s contract is a Major League deal. 1:42pm: The Braves have agreed to terms on a contract with free agent left-hander Ross Detwiler, tweets Ken Rosenthal of FOX Sports. Detwiler, a client of CAA Sports, was recently released by the Rangers after struggling in his first brush with the American League. The Rangers had acquired him from the Nationals in an offseason trade. 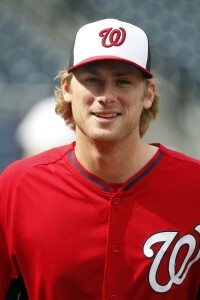 Detwiler, 29, was the sixth pick in the 2007 draft out of Missouri State University. Though he never emerged as the consistent rotation option that the Nationals had hoped for when he was selected with that high pick, Detwiler looked the part of a serviceable starter from 2012-13 (3.59 ERA, 5.5 K/9, 2.5 BB/9 in 46 games/40 starts) and posted solid, if unspectacular numbers in the bullpen in 2014. Last year, he notched a 4.00 ERA in 63 innings, averaging 5.6 K/9 and 3.0 BB/9. The 2015 season, however, has been an ugly on for Detwiler. In 43 innings split between the Texas rotation and bullpen, the lefty has a 7.12 ERA with 5.9 K/9, 4.2 BB/9 and a career-worst 36.4 percent ground-ball rate. With the Rangers, Detwiler cut down on the usage of his four-seamer and relied much more heavily on his sinker, slider and changeup, and the change in pitch selection seems to have contributed to his unfavorable results. The Braves will hope that a return to the NL East and working with pitching coach Roger McDowell can help Detwiler return to his previously effective form. If nothing else, Detwiler should be a useful relief option against left-handed hitters; even in his poor 2015, he held same-handed batters to a .220/.280/.317 slash line. Throughout his career, lefties have batted just .232/.305/.301 against him. Detwiler’s earning $3.45MM this season after avoiding arbitration last winter, but the Rangers will be on the hook for all of that figure, less the pro-rated portion of the league minimum for any time spent on Atlanta’s active roster. JULY 15: The Rangers have requested unconditional release waivers for Detwiler after he rejected an outright assignment, tweets Stefan Stevenson of the Fort Worth Star-Telegram. As a player with more than five years of big league service, Detwiler has earned the right to reject his minor league assignment without having to forfeit the remaining $1.55MM of his 2015 salary. The Rangers will remain on the hook for that amount, less the pro-rated portion of the league minimum for any time he spends on another club’s active roster. If there’s a silver lining on Detwiler’s rough season, it’s that he’s still held left-handed hitters in check quite well. Same-handed batters have posted a meager .220/.283/.317 batting line in 46 plate appearances versus Detwiler this season. Over the course of his career, he’s held them to a similarly weak .232/.305/.301 line. Perhaps, then, a club in need of left-handed relief help will show interest in Detwiler once he officially becomes a free agent. JULY 11: The Rangers have announced that they’ve designated lefty Ross Detwiler for assignment. The move clears space on the Rangers’ active roster for righty Roman Mendez, who has been promoted from Triple-A Round Rock. The Rangers acquired Detwiler from the Nationals for two prospects in December. He got off to a poor start in Texas, with a 10.95 ERA through his first three outings, and never really righted the ship. He still had a 6.95 ERA in mid-May when he went on the DL with shoulder trouble, and he continued to struggle after returning a few weeks later. Overall, Detwiler posted a 7.12 ERA with 5.9 K/9, 4.2 BB/9 and a career-low 36.4% ground-ball rate in 43 innings split between the rotation and the bullpen. His $3.45MM salary will likely prevent him from being claimed. Prior to 2015, Detwiler enjoyed six modestly successful years with the Nationals, who made him the No. 6 overall pick in the draft in 2007. For his career, he has a 4.10 ERA, 5.5 K/9 and 3.0 BB/9 in 514 innings. The Dodgers released closer Brian Wilson back in December, but he’s apparently kept himself busy, recently playing Rick “Wild Thing” Vaughn in a live reading of Major League as the Los Angeles County Museum Of Art. Grantland’s Dave Schilling reports that the flamboyant Wilson dressed for the event in an ’80s Indians uniform and imitated Charlie Sheen’s delivery while reading for the part. Here are more quick notes from around baseball. Agent Scott Boras was critical of the Cubs for their handling of the timing of Kris Bryant’s promotion, but he has no such complaints about the White Sox promoting Carlos Rodon at a similar point in the season, Dan Hayes of CSNChicago.com writes. Of course, the two situations are different — Bryant had a full year in the minors after being drafted and had significant time in Triple-A before reaching the Majors, whereas Rodon, who the White Sox picked third overall last June, had neither. And Boras says that he likes that the White Sox plan to be conservative with Rodon’s innings. “The Bryant situation and Carlos’ situation are very different because of the innings issue,” says Boras. “Because of the idea that frankly, you really want this process to get a foundation to it for a pitcher rather than building — because there’s no repetition in amateur baseball that prepares you for what Major League pitchers have to go through.” The White Sox are having Rodon begin his big-league career in the bullpen, much as they did with Chris Sale. Ross Detwiler has struggled to a 10.95 ERA through his first three starts with the Rangers, but manager Jeff Banister plans to stick with the slumping southpaw, writes Evan Grant of the Dallas Morning News. Detwiler feels he’s found a flaw in his delivery while watching video of Sunday’s start that will allow him to return to form. The Rangers picked up Detwiler in a trade that sent Chris Bostick and Abel De Los Santos to the Nationals this offseason, but his initial results are clearly not what the team expected. After a season in which their pitching staff (and position players) were ravaged by injuries, the Rangers have added an arm to solidify their staff, announcing the acquisition Ross Detwiler from the Nationals. In exchange, Washington will receive righty Abel De Los Santos and infielder Chris Bostick. Detwiler, a former first-round pick, enters his age-29 season after a somewhat disappointing 2014 campaign. Working from the pen, Detwiler threw 63 innings of 4.00 ERA ball with 5.6 K/9 against 3.0 BB/9. Previously, Detwiler had established himself as a fairly solid starter: he carried a 3.46 ERA over 301 2/3 frames from 2011-13, most of it working from the rotation. But the Nats shifted him to the pen given the team’s stacked rotation and the possibility that his stuff would play up in that role. Realistically, he did not have much of a place on this year’s Nationals roster with several lefties and starting depth pieces in place. The southpaw comes with just one year of control — at a projected $3.3MM price tag — but will provide Texas with a rotation option or possible swingman piece. MLB.com’s T.R. Sullivan writes that the Rangers will give Detwiler the opportunity to start, though he could ultimately end up in a setup role if that does not pan out. While it is perhaps optimistic to say he has significant upside at this stage of his career, Detwiler could still deliver plenty of value for the Rangers. In particular, his solid 46.5 percent career ground-ball rate should be an asset with Elvis Andrus and Adrian Beltre in the infield. The 21-year-old De Los Santos split the 2014 season between Class-A and Class-A Advanced, posting an outstanding 1.92 ERA with 10.4 K/9 and 2.9 BB/9 in 56 1/3 innings of relief. In his review of the Rangers’ prospects, Fangraphs’ Kiley McDaniel mentioned De Los Santos as a potential power arm in the bullpen. Bostick, also 21, was acquired by the Rangers in last year’s Craig Gentry trade. He spent the season with Class-A Advanced Myrtle Beach and batted a respectable .251/.332/.412 with 11 homers and 24 steals (though he was caught 11 times as well). Bostick ranked 18th among A’s prospects at the time he was dealt to the Rangers, but his numbers in the Florida State League represented a decline from his work in the Midwest League a year prior. This swap largely kicks off the offseason for both clubs. They have previously been linked in several trade scenarios, but nothing has been consummated. In fact, per MLBTR’s Transaction Tracker, the last time Texas and Washington matched up on a deal, the Nats acquired Tanner Roark — the man who in large part kept Detwiler from a rotation spot last year. Jeff Passan of Yahoo Sports first reported that the Rangers would acquire Detwiler (on Twitter). USA Today’s Scott Boeck reported that Bostick and De Los Santos were headed to the Nats (Twitter link).